Radamel Falcao is a Colombian footballer. He plays as a striker for Manchester United. 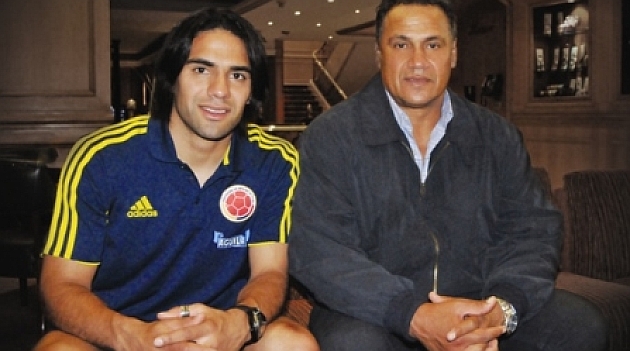 A picture of Radamel and his father can be seen here. Radamel is married to Argentinian singer Lorelei Taron, with whom he has two children. Radamel’s maternal grandparents are Ruperto Zarate and Denis Elvira King (the daughter of George/James King and Juliana). Radamel’s great-grandfather George, who was English, emigrated from the North Yorkshire village of Burn, near Selby, in 1932, to work as an accountant for the United Fruit Company in Colombia. George married a Colombian woman, Juliana. This picture is probably the worst you could pick. He is obviously triracial, probably majority European with African and Native. It seems that you chose his worst photo.